Photobrook Photography: Park Run number 13, unlucky for some, Very unlucky for me! Park Run number 13, unlucky for some, Very unlucky for me! Last weekend when the weather was glorious and the sun was shining I couldn't attend park run. I was pretty gutted and getting the e-mail of results later on that day I realised that it was a good run for a lot of people with loads of PB's so this weekend I was adamant I wanted to do it. Checking the weather during the week it wasn't looking good, with the forecast suggesting that the whole weekend would be filled with gale force winds and lots of rain I still wasn't put off and wanted to run. Heading to the pub on Friday night I made the decision that I would stay too long and wouldn't drink so that I could get up in time to attend park run in the morning. By 1am I was finally leaving the pub, although sober a lot later then I had wanted. I checked the forecast again and it was suggesting a dry morning followed by torrential rain around 10.00am. I got up, ignored the wind howling outside grabbed the rain mack and headed to Lanhydrock park. Arriving there were lots of others who were also not put off by the wind and rain and everyone was warming up and although it was a little drizzly it wasn't all that bad. I lightly jogged to the start line and stood there yawning my head off. Maybe staying up so late was not such a good idea, I'm a girl of routine and a late night really messes with my body clock but I was proud I had got out of bed in such potentially horrible weather and was doing some morning exercise. The run began and we were off and I was still half asleep and yawning and not wanting to be running but as we entered into the woods the flowers and the beautiful scenery took my mind off running and as we headed down into the steep down hill woody section that was it, I did some weird slipping, skidding nearly falling over but saved it moment. I didn't even think about it and kept running but I had immediate pain in my left calf. I continued to jog but it hurt a lot and I walked large sections. 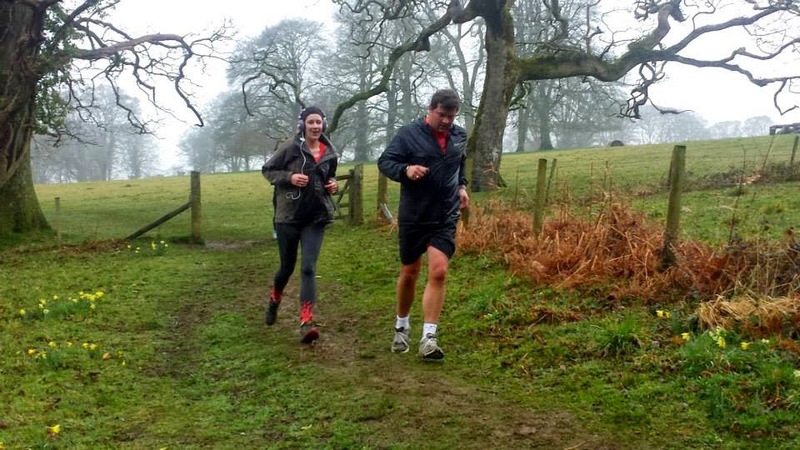 By this time the drizzle had turned to heavy rain, my leg was really hurting and I was soaked through and not really enjoying this weeks park run. I'm pleased I took part and didn't miss another run but I think I might be on volunteer duty for a few weeks now whilst I rest my calf! Moral of the story is..... If you have a late night at the pub and it's raining outside, STAY IN BED, exercise is not good for you!!! !